Part 2 in my gluten-free (GF) research. Please also see part 1, Gluten & the gluten-free diet… what’s up? A guest post from my good friend Denine (mostly from Denine – I added some bits & pieces because some of this was from email conversations & may not have made sense). Denine has been Gluten-free longer than anyone I know, since 1995 to be precise. I consider Denine to be an expert on the subject. Denine also writes two blogs of her own. When I first figured out that wheat (later gluten) was affecting me very badly, GF recipes, food, and information was still in somewhat short supply. It’s so good to see more information and more foods/ingredients becoming available. When I went to England in the early 90’s, GF bread was only available at the pharmacy and required a prescription. Now it seems to be old hat in England, Ireland, and Sweden (and probably the rest of Europe, but those are the only countries I’ve seen first hand). All the larger supermarkets there have dedicated GF sections. I figured out my sensitivity to gluten in 1995, so I’ve been gluten-free for 16 years. Once I realized that my body reacted so badly to wheat, I learned to listen to it and discovered that dairy and soy also affect me badly. But despite those being such common foods in the US and Europe, it’s really not hard to avoid them and eat very well if I cook at home. Most GF bread available in stores is not very good straight from the bag. It needs to be toasted. (Udi’s Bread is the exception) That said, the heavier ones make especially wonderful croutons, which in turn make wonderful stuffing. I haven’t tried them in bread pudding, but would expect them to work well too. For meatloaf, I just soak any of the breads in egg and liquid and they work fine. When it comes to baking, I’m so accustomed to not having the stretchy stickiness of gluten making things rise (and not crumble) that I don’t think of that as much of a factor. When I first started GF baking, I tried using xanthan gum because all the recipes said it made the finished product softer. It didn’t make enough of a difference for me to continue using it, and I think I only used about 1/4 of my first container of it. 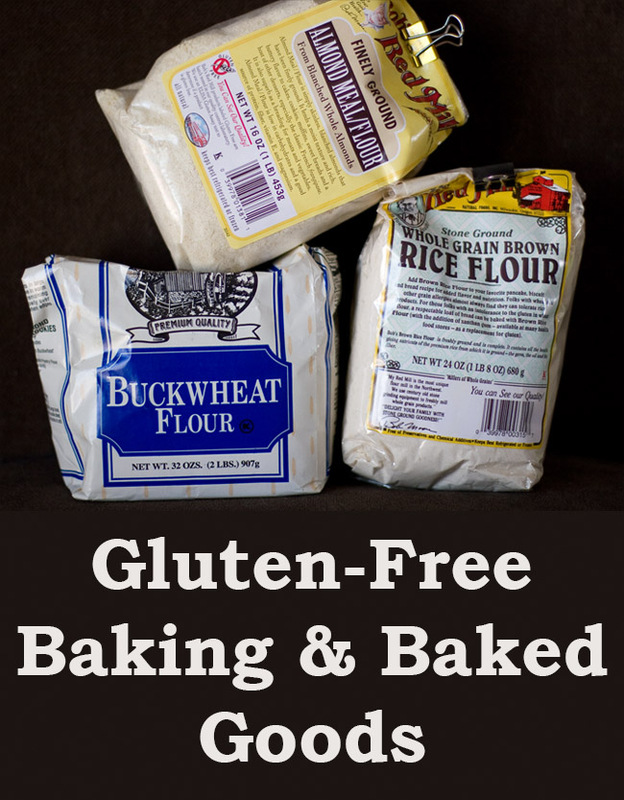 There are lots of “alternative” flours that are great for adding texture, flavor, or making baked goods gluten-free. One ingredient that I’ve found very useful but sometimes tricky is flax. I love the flavor ground flax adds to breads/pancakes/fritters. It works well as an egg-replacer (approximately 1 tablespoon flax in 1/4 cup warm water, let it sit so that the ‘goo’ develops). I’ve found that too much in bread makes it too gelatinous, so that the middle stays gooey and seems uncooked. When ground, it goes off much faster than other flours. So I buy mine whole and grind it in a coffee grinder that I keep just for grains (handy when I want millet flour but only have whole millet, for example). It can be used to make a very high-protein, low-carb bread (see recipe below) that is delicious but can be a bit of a surprise to one’s digestive system. One thing I learned from pre-packaged GF cake and cookie mixes is that mixing the dry ingredients with butter until the mixture is the texture of sand before adding wet ingredients can make a huge difference in the texture. It’s the old trick of getting a very fine very even suspension of flour and fat and it makes the batter/dough as light and fluffy as GF gets. Often I don’t bother to do that for ordinary baking, but I use the technique for special items. Stir together all dry ingredients. Mix together all wet ingredients. Add wet ingredients to dry and stir until well blended and there is no sign of egg white. Let sit for a few minutes to thicken. Line a 10 x 15-inch pan with oiled parchment paper. Pour batter into pan and spread out almost to the edges of the pan. For a more even bread, spread it so that the outer edges are slightly thicker than the center. Bake for 20 minutes or until nicely browned. Cut and serve. Great for those who are watching their carbs and trying to get more fiber. Back in 2001 I made a couple of GF breads for Denine. Here’s the recipe for one of the breads. It tastes good and (if I remember correctly) it wasn’t too heavy. It makes me laugh because whoever wrote the recipe originally noted that the bread is “hypoallergenic” – not a term we use to describe foods very often any more. And, I have absolutely no idea where this came from originally because it was photocopied from a book I checked out of the library. Boil flax seed in 1 ½ cups water for 10 minutes. Remove from heat and allow to cool slightly. Measure ½ cup warm water (about 110°), yeast, and honey into a small bowl or 2-cup measuring cup. Stir briefly and let soak for 10 to 15 minutes to soften yeast. Meanwhile, measure rice flour, quinoa flour, arrowroot, psyllium, and spices into a medium mixing bowl and mix together. When flax mixture has cooled to lukewarm, pour it into a large bowl for electric mixer. Add 1 cup of the flour and the yeast mixture and mix on low speed. Add the vegetable oil and salt and mix well on medium speed. Gradually add most of the rest of the flour, reserving ½ cup. Beat at medium speed for 3 minutes, scraping sides of the bowl often with a spatula. Mix in the last half cup of flour with a spoon. Cover bowl and place in a warm (85°) oven to rise for 1 to 11/2 hours, or until doubled in bulk. Remove from oven and stir with a wooden spoon for one minute. Grease a 9x5-inch bread pan, and dust lightly with quinoa or rice flour. Fill pan with bread mixture. Put back in the warm oven, heating it a few seconds if it is too cool. The dough will rise very quickly. After 10 to 15 minutes, when the dough is just above the top of the pan, turn the oven on to 350° and bake for 50 minutes. Remove from pan immediately and cool on a wire rack. Millet flour and amaranth flour also work well. You can also vary the herbs as desired. These sound fantastic!!! I can’t wait to improve all my baking (I mean, my fiance’s really… He is the real baker) with that blending technique!